U.S. Rig Count: So, I Guess That's Bottom? 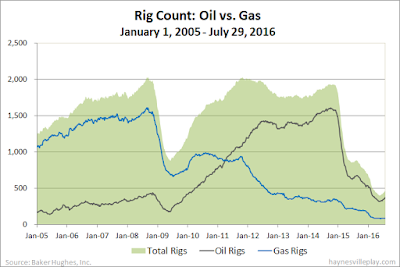 Rig count is usually a lagging indicator of change in the energy market, but it tends to be a pretty accurate reporter of business attitude, if a little in retrospect. Looking at this week's U.S. rig count, it seems to be on the upswing from its nadir in late May (404 total rigs). I'm not equipped to call it a bottom, but it looks like one to me. Today, Baker Hughes reported 463 operating rigs, a 14.6% increase from that low point two months ago. Of that increase, most of it is oil rigs (up 58, or 18.4%), as opposed to gas rigs (only up 4, or 4.9%). Not really unexpected. With the gas storage oversupply situation loosening up a bit, gas prices are now in the $2.80/MMBtu range after spending much of 2016 around or below $2. So at least things are looking up. So will we see a similar rise in gas rigs? Probably not in the near term. Gas-centric firms are more concerned with staying alive than spending capital on new drilling. It's hard to underestimate the damage done to the natgas independents. It's funny how history has a tendency to repeat itself, although sometimes it is more of a reflection than a retracing of steps. As the air (gas?) 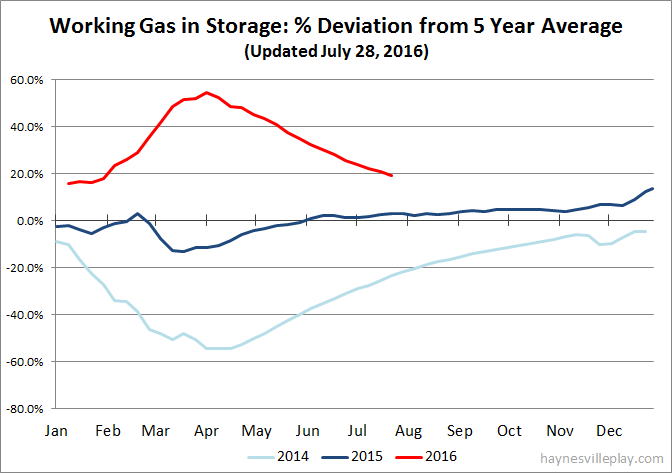 is slowly releasing from the inflated natural gas storage numbers of the past year, it's interesting to see how it is almost a perfect reflection of the gradual buildup of gas in storage from a large deficit two years ago. 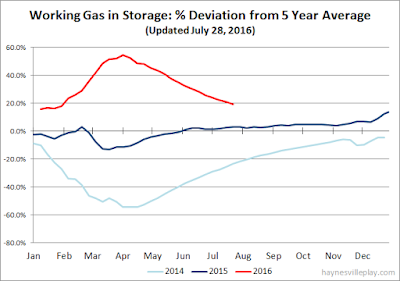 The chart shows the deviation from the five year average for each current year, and the declining surplus this year (red line) is almost exactly matching the 2014 storage build (light blue line).